Even if you’ve never watched a single football game, chances are you know Julian Edelman. Whether he’s breaking records on the field or casually walking down the street in jeans and a t-shirt, the man is a swoon machine. So, it only makes sense that denim company Joe’s Jeans wanted to put those genes in a pair of theirs. 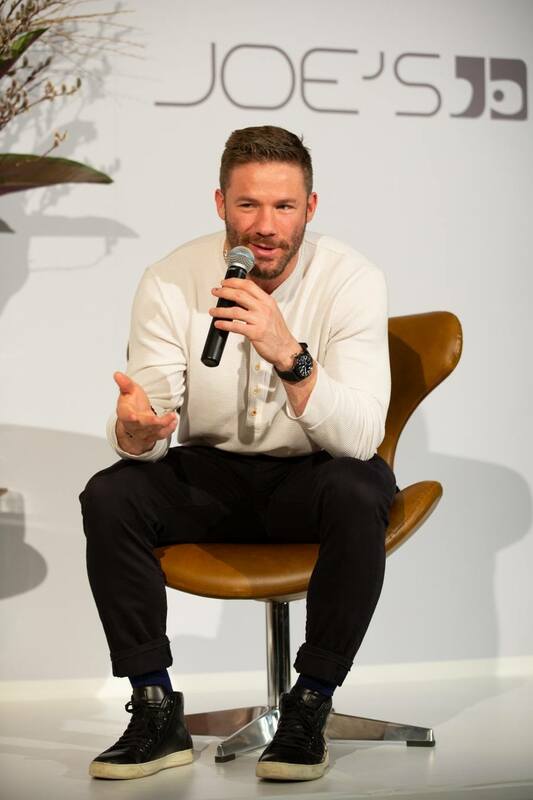 In person, Edelman doesn’t fit the stereotype of a football player. In addition to his interest in fashion, he speaks in a cadence that gives away his California upbringing, as does his laid-back demeanor. You could more easily imagine him operating the most popular taco truck on the beach than tossing aside grown men on a field in a sport that is notoriously aggressive. He talks about his “homies” at his favorite restaurants in town like a regular, calling everyone from the chef to the manager by name. And we all heard that Tim and Nancy Cushman, restauranteurs behind another of Edelman’s favorite spots, bought his beard trimmings last month. “That’s such a cool move by Hojoko,” he says. “I go there all the time and I love their food. It means a lot for them to put their name on something that I put my name on.” His only regret is that he didn’t think to hold the beard’s shape somehow before shaving it off. Although he could always grow another one? Either way, it will be hard for him to lose face in this town.